Stabilizes GH (general hardness) and pH levels. Mineral supplement for all Cichlids. 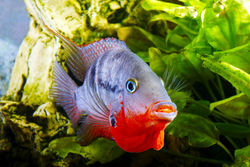 Bio-Min American Cichlid is a premium mineral water conditioner. All aspects of the aquarium improve from the addition of a quality mineral supplement. Bio-Min aids the water, fish, plants, and the beneficial bacteria in the filtration system with essential minerals like calcium, magnesium, carbonates, bi-carbonates, potassium, chloride and sulfates, each of these minerals and more are blended specifically to suit the fish being kept. Bio-Min American Cichlids is designed for American Cichlids that thrive in a pH of 7.40 / 7.60. For dwarf American Cichlids or South American Cichlids that prefer a lower pH we recommend you use Bio-Min Tropical Plus or Bio-Min Discus and Tropical. Directions To increase the GH to 6 degrees (100mg/L) add 5ml (1 teaspoon) to 10 litres of water, only treat the newly added water. For harder or softer water adjust the dose rate as required.